Céline is the Resident Nutritionist for Pine Cliffs Resort. 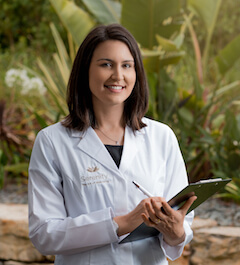 With over a decade of experience in the field, she is passionate about delivering top quality nutrition advice as well as dietary counseling and support. Céline believes in the importance of healthy eating and exercise as the key to preventing illness and promoting wellbeing. Working closely with the Healing Hotels’ Executive Chef Stuart Sage and Spa & Fitness Director Maria d’Orey. Céline is responsible for maximizing the nutritional content of the resort’s dedicated healthy menus, staff training, and revising the popular #PineCliffsLifestyle wellness programs. In addition, she offers personalized nutrition classes and hosts health-focused workshops for both resort guests and locals. Céline has been a member of the Nutritionist Order in Portugal since 2012 and holds a bachelor’s degree in Dietetics and a further qualification in Dietetics and Nutrition, as well as multiple certificates in sports nutrition, phytotherapy and nutritional coaching. Prior to joining the Pine Cliffs team, Céline was a nutritionist for several hospitals, schools and clinics.